This collection of 23 essays on art by one of our leading novelists should come as no great surprise, for in his fiction Updike is a master of complex visual detail. He approaches his current subject matter with modesty, though; he does not regard himself as an expert on art, but instead resolutely takes a middle position of "just looking." Updike begins with a bouquet of roses and weeds extended to the Museum of Modern Art. In the archly titled "What MoMa Done Told Me," the author traces early childhood memories of looking at pictures in "sophistication's toy shop." There, he discovered in the landscapes and nudes of Cézanne and Matisse an idyllic world that consoled his need for religious feelings. MOMA became his cathedral where, when stressed, he could go to gain the spiritual courage to become an artist himself. However, by the 1960's and 70's, the temple became overrun by moneylenders, who opted for "a greedy open-endedness' and "a bigger souvenir shop." 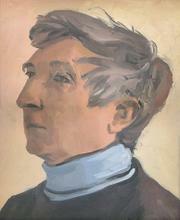 The rest of the pieces her are less personal and more eclectic, and deal with various art exhibits that Updike has reviewed for such journals as Réalities and The New Republic. They present a generally balanced combination of reporting and reflection, with a slight nod toward the jocular magisterial. Updike is fond of witty pronouncements: The total impression of a 1985 Renoir retrospective, for instance, left on his retina "an accumulated taste of artificial sweetener." More sympathetic if no less sophisticated essays deal with the artists of children's books: Andrew Wyeth's Helga exhibition; and a very perceptive and heartfelt study of artistic melancholy, based on the life and works of cartoonist Ralph Barton. A lavishly illustrated, oversized volume, with numerous (132) full-color illustrations setting off the text and charming the eye. Now here's a gift book worth giving--or receiving.